Here is a Hi-Fi power amplifier circuit, built with a power IC TDA2050. This circuit will produce a power output up to 32watt. With good sound quality, high power and very low distortion feature, this circuit will be very suitable for simple and cheap audio systems. 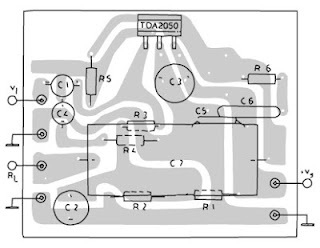 The TDA 2050 is a monolithic integrated circuit in Pentawatt package, intended for use as an audio class AB audio amplifier. Thanks to its high power capability the TDA2050 is able to provide up to 35W true rms power into 4 ohm load @ THD =10%, VS = ±18V, f = 1KHz and up to 32W into 8ohm load @ THD = 10%, VS = ±22V, f = 1KHz. 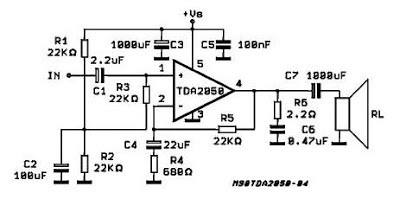 Moreover, the TDA 2050 delivers typically 50W music power into 4 ohm load over 1 sec at VS=22.5V, f = 1KHz. The high power and very low harmonic and crossover distortion (THD = 0.05% typ, @ VS = ±22V, PO = 0.1 to 15W, RL=8ohm, f = 100Hz to 15KHz) make the device most suitable for both HiFi and high class TV sets.